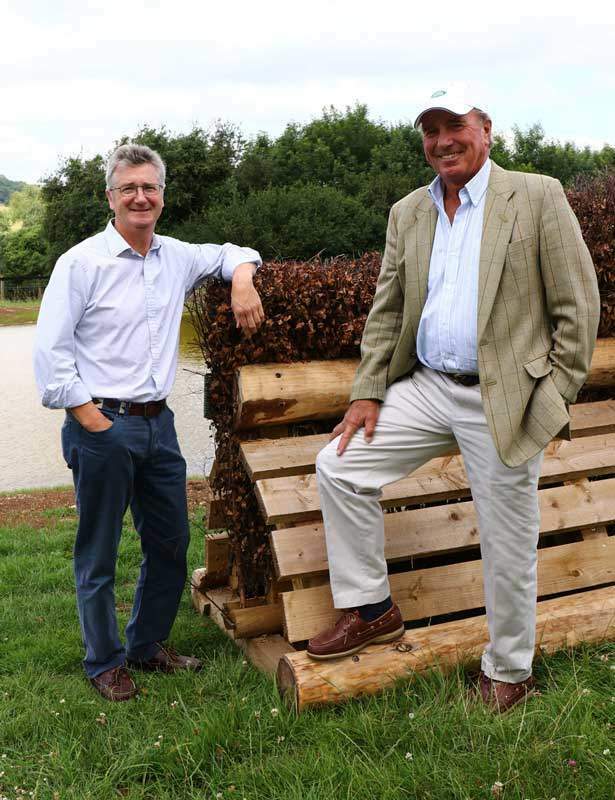 Captain Mark Phillips – Co Chairman and Cross Country Course Designer at The Festival of British Eventing – gives you an insight into this year’s British Open Championship CIC3*, incorporating the Event Rider Masters cross country course. The cross country course starts out in familiar fashion over the Bedmax Bales (1) and the Renasan Log (2) that will help to settle the nerves. The Land Rover Above & Beyond (3) is in the corner of the Trade Stand field and is one the riders always fear with the dark wood and the steep descent behind. Courage, commitment and positive riding is the order of the day here as this is so early on. All will enjoy coming back out of the woods and into the Trade Stand area over the Walnut Hill Equine Veterinary Wall (4) and the ‘roller coaster’ down over the Hamptons International House (5). However as riders come up the bank to the Smith & Williamson Offset (6ab) there is a brand new challenge as horses jump over a big hedge corner and then three strides to a skinny house. There is an alternative but riders will need to have their big game pants on here. Now out on Avening Banks horses and riders will feel like they are in open countryside. The Richard Coglan Wall (7) and the enhanced Pol Roger Bar (8) are straight forward but need respect. Similarly the British Equestrian Trade Association (BETA) Wall (9) and the Hamptons International Barn (10) will hold few fears. The Dodson & Horrell Staypower (11ab) coming back over the lane starts the most intensive part of the course and will need some thought as riders only have three strides to a skinny hedge having dropped down over the Wall. The Equex China Pond (12ab) is brand new and while the Hedge before is not too daunting, riders will need to put the peddle to the metal as they come through the turn to the Log on top of the Bank. There are then only three strides before the Hedge into the House of Fraser Water Splash (13ab) and the missable Triple Brush five strides later. There is a small respite over the large Event Rider Master (ERM) Log Pile (14) before they come back to the Log into House of Fraser Water Splash (15ab) and the large Double Brush that follows. The Jon Williams Stables Wall (16) has not changed in over 30 years but has always commanded respect before the descent down into the Park Bowl to the brand new Neptune Kitchen (17), the Land Rover at The Folly (18ab) is again an old favourite but the angle to the Corner makes it as missable as ever this year. The ERM Trakhener (19) is an old favourite as riders come down the hill at terrifying speed before climbing up the bank to a brand new Harringtons Arched Log (20), the product of one of last year’s winter storms. Riders then continue up to the House over the BETA Double Brush (21) before descending into the bottom of the Park Bowl over the ERM Corner (22ab). The Diamond Brush Triple is simple enough, but the shape of the jump here will play a large part in determining how the riders solve the puzzle as to how to get the bending four strides to the Corner. The TopSpec Saddle Horse (23) is simple enough but the ERM Oxer (24) needs respect as it is new and wide and is not a given with its downhill approach. The Red Savannah Water (25) is an old favourite with the crowd as someone always takes an early bath here. It is the last question though and riders should enjoy the trip up the valley to the Finish over the Joules Wagon (26) and the Event Horse Owners Association (EHOA) Festival Finale (27) and a new finish line. Hopefully riders will enjoy the changes this year. Either way the winner will be a worthy Champion around the terrain of Gatcombe Park!